Some exciting news for you today! It's Blog Hop time!! Today we are CASE-ing (Copy & Selectively Edit) the wonderfully talented Shannon Lane, who is also joining us on this hop! I hope you find great inspiration from all the projects in this hop. 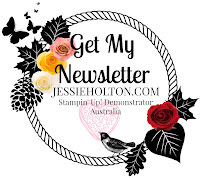 You may be starting the hop here at my blog (Jessie Holton) or you may have come from the previous person on the list. Be sure to click on the next person in the list to continue your blog hop adventure casing Shannon's work. Here's Shannon's card which I have chosen to case. 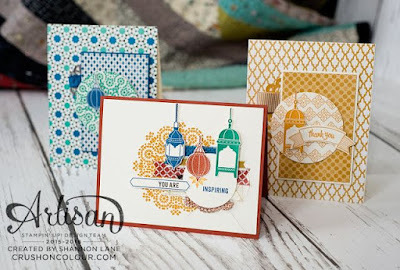 I really love the layout with this wonderful Moroccan Designer Series Paper (DSP)! I have cased the two cards at the back of this pic. And here is my take on Shannon's projects. Please excuse the terrible spelling in my pics! I made 18 cards with half a pack of Moroccan DSP. I love the colours in this paper & the designs are so, so pretty! I used the six larger patterns for the main front panels & then three of the smaller patterns each for the smaller panel & circle. I have cut the circles using the largest circle from the Layering Circle Framelits & my Big Shot. I have backed the smaller panels on Whisper White & propped them up on Dimensionals. The sentiments are also propped up on Dimensionals. I put them together totally randomly, having mixed up all the cardstock, DSP & stamped images first & then just grabbing the layers & sticking them together, as I wanted them to all be different. And they are all gorgeous, the patterns just go together so well! I used the Moroccan Nights stamp set for the lanterns & the Thoughtful Banners Bundle for the sentiments. I have just used the 'thank you' and 'celebrate' sentiments & apart from lining them with Whisper White, I have left the insides unstamped for now, so I have a batch of cards ready to use for any sort of occasion. I have already posted a thank you card for an early baby present & a couple of celebrate cards for friends' anniversaries. The inks I used were Dapper Denim, Emerald Envy, Delightful Dijon & Cajun Craze. I have used Choc Chip, Early Espresso, Emerald Envy, Dapper Denim, Cajun Craze & Whisper White cardstock. I also added some Burlap Ribbon & Metallic Foil Doilies in Gold, cut in halves. Please have a hop around & check out all the awesome projects made, casing Shannon's work!